Linda is currently spending most of her time doing research and writing for the next book. At the Chiddingstone Literary Festival Linda, Leanda de Lisle, and Lucy Moore discussed Royalist Women. Leanda is the author of “White King: Charles I – Traitor, Murderer, Martyr”. Lucy’s new book is “Lady Fanshawe's Receipt Book: An Englishwoman’s Life During the Civil War”. At the Berwick Literary Festival Linda gave a talk about her current book, Royal Renegades: the children of Charles I and the English Civil Wars. Linda gave a two-hander with Charles Spencer at the Cheltenham Literature Festival in a session entitled Charles I: a toxic legacy. Linda gave a talk about Royal Renegades at Brenden Books in Taunton. Unfortunately Linda was unable to take part in Alison Weir's Tudor Tapestry tour due to illness, She was to be speaking about why Henry VIII married so often, his sixth wife, Katherine Parr and his daughter, Mary I. In the afternoon Linda spoke to history students about the Queens of Henry VIII. She shared tea and supper with a lively and interesting group of young scholars. At 19:30 she gave a lecture about her latest book, Royal Renegades, The Children of Charles. Linda appeared with Lucy Worsley at Hampton Court Palace for a behind-the scenes look at the Six Wives of Henry VIII, in connection with Lucy’s new BBC1 series. Linda spoke about her new book at the Richmond Literature Festival in the Hyde Room, York House, Twickenham, at 7:00 pm, to a good audiance. Linda talked about ‘Royal Renegades’ at the Tower of London as part of a series sponsored by Historic Royal Palaces . Linda spoke about ‘Royal Renegades: the children of Charles I and the English Civil Wars’, organised by Lindum Books, Lincoln. The event took place in The Collection auditorium. A talk by Linda on ‘Royal Renegades’ at Gainsborough Old Hall, Gainsborough, DN21 2NB at 1930. Linda presented the paper ‘Rival Queens: Mary Tudor and Mary of Guise’ as part of the conference commemorating the 500th anniversary of the birth of Mary Tudor. This was at the Institute of Advanced Studies, University College London. Linda gave a talk on Mary Queen of Scots and the Stuart inheritance at the very interesting Markenfield Hall, Ripon. Members of the Friends of Markenfield Hall formed a fine and receptive audence. "Linda Porter on Katherine Parr"; spoke at the last in Oadby Libraries' Six Wives of Henry VIII series. The event was at Oadby Library,10 The Parade, Leicester, LE2 5BF. 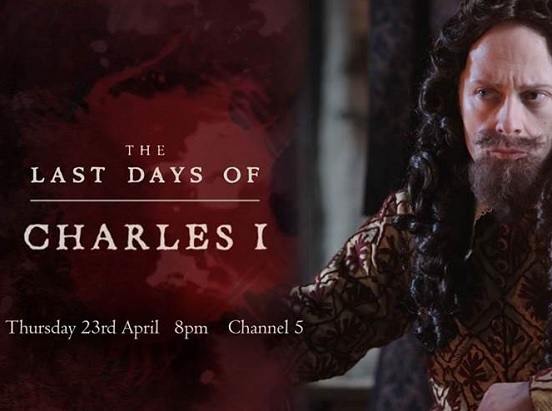 Linda appeared as an expert in The Last Days of Charles I with several other historians of the period. 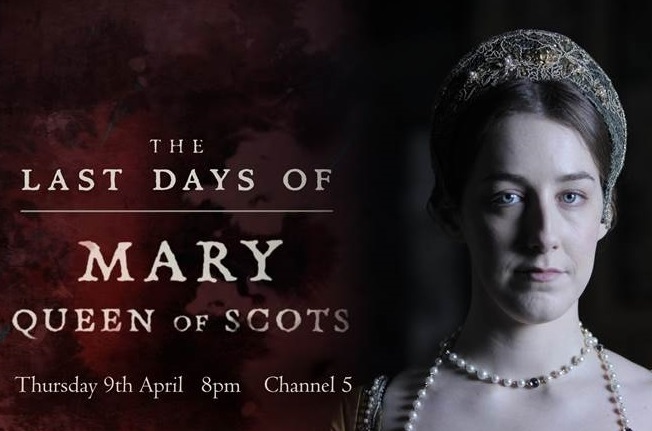 Linda appeared on Channel 5 (UK TV) in The Last Days of Mary Queen of Scots with several other historians. The Sevenoaks Historical Society had a good audience to hear Linda talk of the royal revelries of Scots and English kings. 28 August 2014, Leeds Castle at 3:30 pm. As a part of The Medieval Festival at Leeds Castle Linda presented the third talk of the day; 'Three Tragic queens of the Tudor Age: Katherine Parr, Mary I and Mary Queen of Scots' at The Maiden's Tower at Leeds Castle at 3:30 pm. Tudor Marriage. Linda spoke, along with novelists Vanora Bennett and Liz Fremantle, to a good audience at Hounslow Library. Vanora Bennett is the author of The People's Queen and numerous other books. Liz Fremantle is the author of Queens Gambit and Sisters of Treason. 12 May 2014 at 7 pm. Linda enjoyed her evening talk about Mary Queen of Scots in Sheffield. Thanks to David Templemen and the Friends of Sheffield Manor Lodge for a fine evening and helping us out of the car park. Linda had a fine day returning to the University of York presenting a lecture about the Tudors and Stewarts in Kings Manor to a very good audience. Linda spoke in aid of fund raising for the International Red Cross. Members of the Tiffany Circles from America, Australia, Britain and Canada gathered in London for their Inaugural International Celebration Weekend. 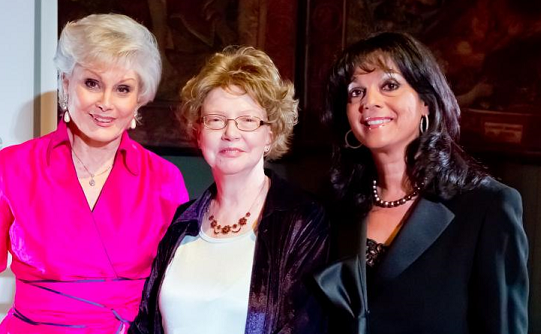 Angela Rippon (left), British Red Cross vice president compered the Celebration dinner in the Great Hall at Hampton Court palace. Dr. Sindy Newman (right), the British Tiffany Circle Chair, was host to the event. Linda spoke of two British Queens; Margaret Tudor and Katherine Parr. 7 November, 2013 at the Stables of the George Inn, Eton. Linda chaired a discussion with the historical fiction writers Elizabeth Fremantle, Vanora Bennett, and Joanna Hickson . The Stables at the George Inn was packed tightly with people who had a fine time learning about the lives and times of Catherine of Valois through to Katherine Parr. Elizabeth, Vanora and Joanna gave great insight into their fictional understanding of the characters they bring to life. Linda added her agreement, information, and elements of quotation in her on-going effort to allow the historic figures to speak for themselves. The BBC History Magazine's History Weekend in Malmesbury. In the magnificent setting of Malmesbury Abbey Linda spoke about the struggle for control of the British Isles in the 16th Century between some of the most colourful monarchs in English and Scottish history. This was the backstory of Mary Queen of Scots. Monday 30th September 2013 at 13:30. Wigtown Book Festival at County Buildings, Main Hall. Linda spoke to a packed house with good questions and a book signing afterwards. Watch this space for further detail and possibly a link to a recording. . .
3 September, 2013 at the Tower of London. Linda wil talk about her new book, Crown of Thistles, at 7:00 pm. 14 August, 2013 at the Edinburgh Book Festival. "To coincide with a National Museum of Scotland exhibition, Linda and Rosalind Marshall spoke widely about Mary Queen of Scots, her times and her forbearers. There was a sell-out crowd for 10:30 at the ScottishPower Studio Theatre "
20 July, 2013 at Kelmarsh Hall, Northamptonshire. Linda's talk at the BBC History Magazine tent ended a busy day of historical lectures amid the sounds of reenactment cannon fire. 28 May, 2013 at Hampton Court Palace. Linda told an attentive audience about Mary Tudor and answered questions about her first book in the lovely setting of Hampton Court. Linda spoke about her forthcoming book 'Crown of Thistles: the fatal inheritance of Mary Queen of Scots' as part of the Wrest Park Literary Season. Linda spoke at the United Reform Church about 'The Remarkable life of Katherine Parr'. The literary lunch as part of the quincentenary celebrations of Katherine Parr's birth. In the morning Tim Porter spoke about Leland's Main Account of Winchombe and Sudeley. After lunch Professor Eric Ives, an eminent Tudor historian, led a discussion of the life of Katherine Parr by three currently published authors. Linda gave a general overview then Susan James examined paintings of the queen and what we could learn from these images. Janel Mueller then looked into the writings of the first published Queen. The rain fell on Sudeley Castle but, dry inside a large group enjoyed learning about the lady buried nearby. Linda gave a talk at The Old Tea House which was followed by a full afternoon tea. She spoke about the new book which she is currently writing. “Crown of Thistles; The Fatal Inheritance of Mary Queen of Scots.” The book will focus on the rivalry between the Tudors and the Stewarts and Linda told the story of the marriage between 13 year-old Margaret Tudor and 30 year-old James IV of Scotland in 1503. Linda greatly enjoyed the visit to her university and the response to her talk, The last wife and the first queen: the friendship of Katherine Parr and Mary Tudor, by the public and members of the university.